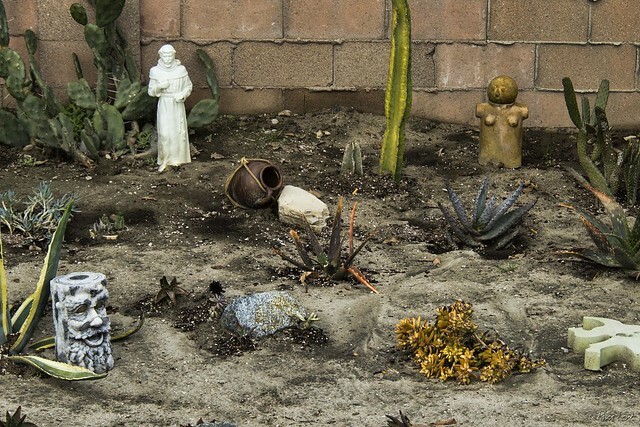 Downey Daily Photos: Backyard art? On our riverbed walks, we pass the back sides of houses. Mostly just fences, but occasionally, we see an extension of the yard. Sometimes a vegetable garden (which seems like a very cool use of the space), or sometimes a dog run. We've even seen a goat! Or, in this case, yard art. A wildly eclectic bunch of statues and figurines that makes me very curious about the front of this house.